During a panel at the Shared Use Mobility Summit last week to discuss competition for street space, CMAP senior planner Lindsay Bayley wanted the audience of transportation professionals to consider charging to manage the surge of app-based car use. Other panelists included officials at the New York City, San Francisco, and federal transportation departments. The federal planner was there because the U.S. Department of Transportation has funded many high-tech pilots in cities. Three vehicles block the bike lane on Washington at Canal. This is also an indictment against the design of the street here, given a lot of unmarked open space and the wide lanes in a downtown area that could be reconfigured so that people aren’t parking against the bike lane in the curb. Not every curb is equally valuable, though, and so dropping off or picking up people in some places would cost more than at other places. The “curb touch fee”, or curb pricing, in River North on Friday night would cost more than in Mount Greenwood. What’s great about this idea is that it actually doesn’t need to involve a hardware device like the iPass Lyftuber already know exactly where each of their vehicles dropped off or picked up a passenger. What it would take for implementation is a map, drawn by the city, that outlines the prices of each curb. Someone in the audience questioned if this should only be implemented for Lyftuber, or everyone else driving in a congested area. The answer? It should apply to anyone trying to get access to the curb with a vehicle. 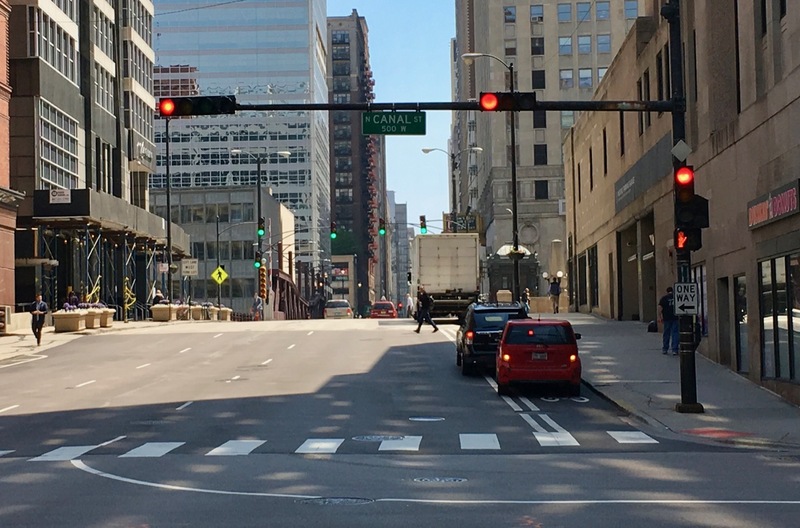 Chicago, to its credit, now charges a fee in some loading zones downtown, but this is for longer term loading and unloading, not the hundreds of times a day motorists are blocking people walking and biking downtown for a five minutes each. The fee is paid at parking meters that have a red colored “P” symbol. Coord’s Curb Explorer map color codes curb access regulations in San Francisco. Bayley also said the fees collected from the curb access could be spent in the neighborhood. That sounds like the parking benefit district in Old Pasadena, in Pasadena, California, and the Special Service Areas in Chicago, where a slight increase in property taxes is spent on streetscape and business façade improvements. 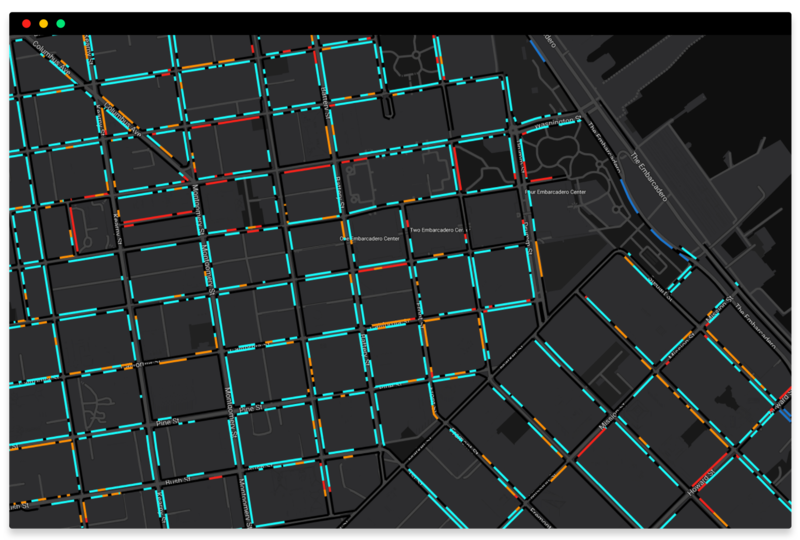 To implement this idea, two companies are already building software for cities: Coord has a “Curb Explorer” map for cities to mark rules for loading and parking on each block, and CloudParc uses surveillance cameras to identify open parking spaces and can automatically issue invoices to curb users. I also don’t trust Lyftuber to self report accurately, so another vendor would be necessary. What’s to stop people from figuring out just how close to the curb they can get without activating the transponder, and then simply stopping there? “What’s great about this idea is that it actually doesn’t need to involve a hardware device because the Transportation Network Companies – an industry term for Lyftuber – already know exactly where each of their vehicles dropped off or picked up a passenger. What it would take for implementation is a map, drawn by the city, that outlines the prices of each curb. Those two paragraphs, one of which comes right after the other, completely contradict each other. One is a fact, the other is a suggestion; no contradiction. OK, fine. If one wants to get truly technical, they could say that the paragraphs themselves are not contradictory. But the suggestion made in that second paragraph is contradictory to what is before it. The way it comes across in the article is odd because there is no acknowledgement of this contradiction and the phrase “the answer” suggests that the person on-stage answering the question (apparently Bayley) doesn’t acknowledge it either despite apparently answering the question in a manner inconsistent with what she had just said. And by the way, has there been a merger of Uber and Lyft that I haven’t heard about? What is with the word “Lyftuber”? It strikes me as incredibly silly. Why not just say “Lyft and Uber” or “ride share companies”? I mean it’s not as if its a huge pain to use the word “and” and to capitalize two words instead of one. I don’t know why we need (another) fancy device to do this. Uber already has dynamic pricing and charges more money to drop off in congested areas or at congested times, which matches pretty well with the areas/times when curb space is “most valuable”. Just tax the rideshare companies as a flat percentage and it will already reflect that added value of certain curbs. These complex systems are interesting but ultimately any taxation scheme will generate cheating or loophole-finding, and the more complex the tax scheme the more opportunities there are to cheat. Indeed. I have mixed feelings about this, because it could act as a disincentive for drivers to pull to the curb to discharge passengers.. Many dooring crashes happen because a driver does NOT pull to the curb and stops in the traffic lane. I’d rather see designated spots with a requirement to stop there and tickets for those who drop off passengers while blocking crosswalks, bus stops, stopped in a traffic lane, etc. Or worse, not getting close to the curb at all! This is a ticking time bomb of liability for ride share, there is zero regulation regarding the “passengers must enter and exit on the curb side of the vehicle,” and at some point, somebody is going to get seriously injured or killed throwing open a door and exiting into moving traffic. Fuel to the fire here is Chicago’s nonsensical “rush hour lane” approach, in which the extra “lane” encourages drivers to hug the curb, as these arterial streets were never designed to have more than one lane for each direction. I also fail to see the need to tie it to “curb” use at all. As I think someone else mentioned, just establish congestion zones based on time of day, and adjust the city tax fee charged per ride depending on whether someone is picked up or dropped off in that zone. Charging for curb use seems like an unnecessary hassle, unless we’re trying to drive them to some sort of collective pick up area that would be safer and not subject to a charge, which doesn’t seem to be the case. If you want to move to charging private vehicles as well, move to the same type of dynamic pricing for people who enter the loop and/or other congested areas. I believe London has already done that for its CBD, so systems exist out there already. My thoughts as well. Ride share drivers not pulling to the curb to load and unload is already a huge problem. Rewarding bad behavior by letting them avoid a fee is only going to make the problem worse. Lindsay was using this more as a way to communicate how we have a very efficient system set up to collect money from people who use certain roads. Or, she made a suggestion, and someone challenged her, and she modified her suggestion to say that, “really, this kind of curb access charging should apply to anyone”. As I wrote, Lyftuber already has the solution in their minute tracking of every vehicle. It’s the last part I’m objecting to. The city doesn’t need to come up with a fancy map like the Coord one. Rideshare companies already have surge pricing maps that shift dynamically and charge riders more to travel in certain areas of the city. These maps aren’t available to governments or to the public, but it shouldn’t matter. If rideshare is taxed as a percentage, then governments will get more money from rides in the surge zone. Of course, this doesn’t allow fine-grained, block by block control of the tax, but I think it’s absolutely ridiculous and counterproductive to aim for that anyway. Both rideshare companies and users will find ways to play games with the map. Governments should instead focus on tangible improvements. Don’t want rideshare drop offs in the curb lane? Get rid of the curb lane and widen the sidewalk. Don’t want rideshare drop offs in a bus lane? Put cameras on the front of the bus, and issue tickets. Instead of “Lyftuber”, how about calling them TNCs — the industry term — which avoids giving free advertising and validation to the duopoly of these two behemoths. There are other TNCs and I’m sure they’d prefer you not describing the industry as though there weren’t. This has been particularly bad in front of Chase Tower on Dearborn. Some bollards are missing (possibly due to construction) and drivers are pulling all the way over left into the PBL. Man, I wish we could do that anyway. They even forgot to add Via, which is prominently growing in Chicago. I love the discussion that my crazy idea has spurred- even if it’s not a feasible plan at all. The main point is that cities should have more control over their streets than they’re exerting. Lanes for buses, lanes for bikes, wider sidewalks, enforcement of cars using these spaces, maybe cordon congestion pricing is the better idea than curb touch point. I don’t know! But we need to prioritize people first. And not let the influx of cars, private and shared, to take over our streets.